"Milo is one lucky cat. He's got nine lives and a best friend." 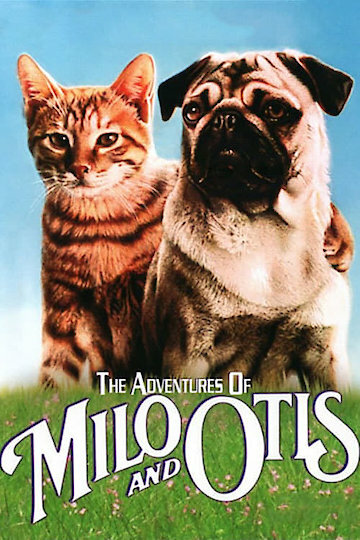 The Adventures of Milo and Otis happens to be one of the greatest animal movies of all time. Unlike today's movies where everything is computer animated, Milo and Otis was filmed completely with live actors, the animals! A human is not present once in the entire movie. Voice actors give these animals life on screen. This adventure starts out with a feisty tabby cat, Milo, and a brave pug, Otis. These two meet and aren't the best of friends at first, but they become very close friends quickly. Their journeys soon become very epic when Milo the tabby cat decides to ride in a box down the river! Quickly the stream starts to carry Milo further and further away. Courageous Otis soon springs to the rescue, only to become quite lost himself. This adventure follows these two animal heros as they brave the elements while searching for each other and their way home. They learn lessons on the way, meet new friends, and face dire obstacles. The Adventures of Milo and Otis is currently available to watch and stream, buy on demand at Amazon, Vudu, Google Play, iTunes, YouTube VOD online.